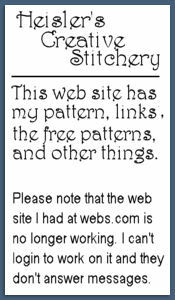 Heisler's Creative Stitchery: Almost done with new site! Almost done with new site! 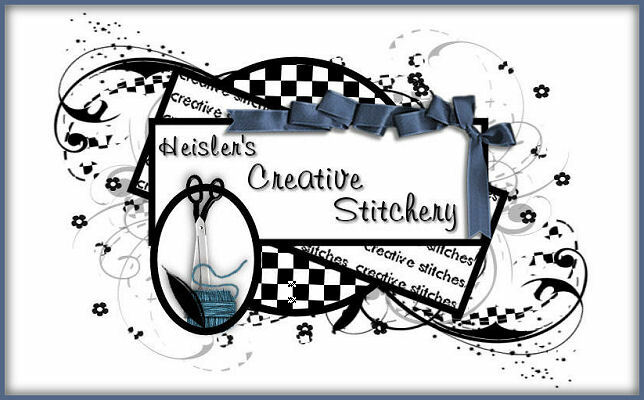 I have 2 sites for heisler's creative stitchery finished! They are the same except one is at webs.com and the other is at my old tripod addresses. I thought I'd do 2 in case one is down. That happens a lot, I've come across it. When you want free sites I guess you have to expect it. I'm now waiting for godaddy to ok my free space with them. I didn't know it would take at least 24 hours or I would have signed up for it last week. I got the free space because I have my domain with them. I plan on putting an opening page here with links to the 2 sites. It will be the page that is www.heislerscreativestitchery.com I may eventually put yet another mirror site at godaddy. A quick promo for webs. I really like them and they only require a button or bar on each of your pages. It's great that they let you choose from an assortment. I was able to get a small red button that looks great at the bottom of my pages. Of course the tripod sites have ads top and bottom with no choice of what kind. I had the 2 adresses from when I first started a web site so I thought I'd use them. Google finally moved my googlepages over to sites and now it's a mess! I'm going to have to do a lot of work on it so I can use it for doll photos again. With all the boxes and bags of thread I have I didn't have the size 10 in black I needed for this so I'm tatting it in ecru. I have black in every other size. I'm really enjoying tatting again and have the fall tatting patterns almost done. Then will come writing the directions. I think I'll give customers a choice on buying the patterns with or without the basic directions. I'll be able to lower the price a bit, too. I'm off to try to fix my googlesites pages. Will fix the links at the side when I get them done.